Small: Sheet 24"x30.5" design 21"x 27". Large: Sheet 24"x30" design 19"x24"
Why use wallpaper when you can try this Moroccan inspired stencil Damask Nadya! Reusable stencils save you money and make you feel proud of your creation. 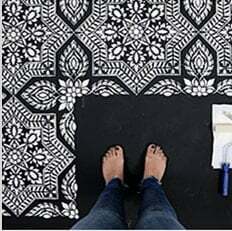 This ethnic allover pattern is perfect for DIY decor. Registration is built into design for ease of aligning. Damask stencil patterns bring stylish elegance to any room. Great for traditional or contemporary decor - just play with your color combination! Looks stunning on the accent wall. This beautiful damask pattern is offered in two scales: large and small. Choose the large scale for larger rooms and rugs and the smaller one where a tighter, more detailed scale is needed. See pics for details. The small scale pattern comes with a FREE Top Edge stencil to help you complete a wallpaper look! The large scale damask doesn't come with top, as it doesn't need one. Stencil has an easy registration system, just use the parts of the design to align the stencil. Don't worry about super perfect alignment: in the end your eye will never ever notice if it's a little bit off. We decorative pros "fudge" allover patterns all the time! The walls in most houses are often not straight, so some "fudging" while stenciling helps a lot.